Silvio Berlusconi Q&A: What happens next? Italian Prime Minister Silvio Berlusconi has survived a dramatic vote in the lower house of Italy's parliament. So what is next for the man they call Il Cavaliere? It is believed the support of two MPs aligned with his former ally, Gianfranco Fini, proved crucial in the vote but the concessions he made to secure the votes of other MPs are not yet clear. Can he now press ahead victorious? He could theoretically continue in office until parliamentary elections are due in 2013. Mr Berlusconi offered a new legislative agenda and cabinet positions to MPs who backed him, so a reshuffle of his cabinet is highly likely. He maintains only a tiny majority in parliament so his ability to press ahead with any sort of legislative programme is severely restricted. Elections are off the immediate agenda but it seems unlikely Mr Berlusconi will be able to complete his term of office because of the potential for paralysis in parliament. Commentators are still predicting elections in 2011. 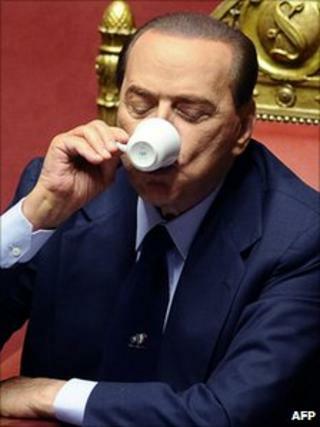 Can Mr Berlusconi shore up his government? His main problem is his shrinking coalition. His party now relies on the Northern League for support and that is unlikely to change. He will have to find a way of forging alliances with the centre or centre-right. Is the mood of crisis going to continue, then? In January, his government could face further problems from the judiciary. On Tuesday, Italy's constitutional court decided to defer a hearing on a controversial immunity law which gives Mr Berlusconi and other ministers protection from prosecution for 18 months. The court is expected to decided whether or not that law is valid. Mr Berlusconi is a defendant in two corruption and tax fraud trials which have, in effect, been suspended because of the temporary immunity law. He is accused of bribing British lawyer David Mills to give false testimony in 1997 to protect the media tycoon's business interests. He is also accused of tax fraud and false accounting in the acquisition of television rights by his Mediaset broadcasting empire. The prime minister argues he is the target of left-wing prosecutors but Gianfranco Fini has complained that the judicial threats are his main incentive for staying in power. What next for the opposition? The centre-left is widely seen as too divided to form a significant challenge to Mr Berlusconi. If another move against him were to be made in the coming months, it would more likely come from Gianfranco Fini's Future and Freedom for Italy (FLI) party which split from Mr Berlusconi in the summer. They have already had discussions about forming a Third Way with Pier Ferdinando Casini's Union of the Centre (UDC).